Faneuil Hall Marketplace in downtown Boston contains Faneuil Hall, Quincy Market, North Market and South Market. Peter Faneuil, Boston’s wealthiest merchant, built Faneuil Hall as a gift to the city in 1742. Since then, it has served as a home to merchants, fishermen, and meat and produce sellers, and provided a platform for the country’s most famous orators. Called the “The Cradle of Liberty,” the colonists first protested the Sugar Act in 1764 and established the doctrine of “no taxation without representation;” Samuel Adams rallied the citizens of Boston to the cause of independence from Great Britain in the hallowed Hall; George Washington toasted the nation there on its first birthday, and many speakers—including Oliver Wendall Holmes, Susan B. Anthony, Bill Clinton and Ted Kennedy addressed the citizens of Boston there. The famed “Golden Grasshopper” weathervane was placed atop Faneuil Hall in 1742. From this perch, the grasshopper has witnessed the remarkable growth of the city and over 260 years of American history in the making. In 1761, a fire at Faneuil Hall damaged the grasshopper weathervane. Thomas Drowne, a blacksmith and the son of the grasshopper’s creator, repaired the weathervane and inserted a “time capsule” in its stomach. The capsule, which is engraved “Food for the Grasshopper,” includes historical newspapers, coins, and messages from mayors that have been added as the grasshopper has been periodically refurbished. 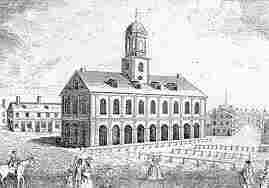 Faneuil Hall was expanded in 1826 to include Quincy Market, which was designed in the then-popular Greek Revival. The market remained a vital business hub throughout the 1800’s; but by the mid-1900’s, the buildings had fallen into disrepair and many stood empty. The 1976 renovation was the first urban renewal project of its kind, one that spawned imitations in this country and abroad. Thanks for this great post. 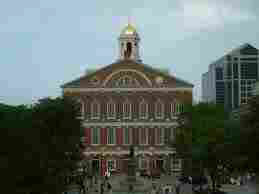 I grew up and lived near Boston for most of my life and have visited Faneuil Hall many times. It is a fantastic hub of activity. Wouldn’t you just love to get a peek at that grasshopper food? Rita, I love Boston! I went to college a few miles outside the city. You probably didn’t know I’m descended from the same Anthony family as Susan B. I’m also descended from the Brownells–her middle name. I think our common ancestors were from the 1600s, so we wouldn’t have been closely related. Thanks for the info on Faneuil Hall.